I have felt lately that God is trying to teach me a lesson, and I’m trying to avoid having to learn it the hard way. My heart has been hungry, and I haven’t been able to put my finger on what it is that I’m starving for. I think what God’s trying to teach me is that Jesus is my daily bread. I’ve always struggled with worry and depression, so I tend to shut down when the to-do list stretches into the distant horizon, and I can’t find rest anywhere in it. My heart, mind, and soul are hungering for something; and it’s not something I can provide for myself. As I read the Old Testament, I see how God provided manna for the Israelites – but only a day’s worth. The people tried to provide for themselves and gather extra (against his instructions), and it rotted and became inedible. God knew his people. They had a reputation of turning from God every time they didn’t feel they needed him anymore. So, in his mercy, he gave them this act of daily dependence for their most basic need…for daily bread. They needed a need to keep their eyes focused on their Provider. In Deuteronomy 8:3 we read, “He humbled you, causing you to hunger and then feeding you with manna, which neither you nor your ancestors had known, to teach you that man does not live on bread alone but on every word that comes from the mouth of the Lord.” Fast forward to the Gospels where Jesus quoted this verse to Satan to resist the temptation to turn stones into bread to ease his hunger (Matthew 4:1-4). And just before the passage in which Jesus taught about why we don’t need to worry or be anxious (Matthew 6:25-34), He taught us to pray, saying, “Give us today our daily bread” (Matthew 6:11). When Jesus sees thousands of hungry people he miraculously, mercifully multiplies food to feed everyone. So, the next day they come back looking for the same physical provision. Jesus said, “I am the living bread that came down from heaven. Whoever eats this bread will live forever. This bread is my flesh, which I will give for the life of the world” (John 6:51). There is a thread throughout scripture that begs us to see that the hunger in every heart is satisfied only through consuming the gift of Jesus’ body, which was broken for us. Jesus Christ. Living Bread. Broken and offered freely to all who would eat. He is the daily bread he told us to ask the Father for. We need Jesus, the Word made flesh, to be the thing we need today. I don’t know about tomorrow…but is Jesus enough for today? If God provided me with nothing else today, would He be enough? I think this is the reason Paul could say that he’d learned to be content, or full, in all circumstances, whether plenty or need – because as he said, “I can do everything through him who gives me strength [or feeds, nourishes me]” (See Philippians 4:11-13, inserted words mine). Most of us have never wondered if we’d have food to eat tomorrow. We seek out food at the slightest hint of hunger. Don’t we need to hunger for Jesus in EVERY circumstance so much more? When my day is done, but the to-do list isn’t — Jesus is enough. When I go to bed with a heavy heart for the good I ought to have done (James 4:17) — Jesus is enough. When I feel inadequate to minister to my own heart, let alone anyone else’s — Jesus is enough. When I’m worrying about whether my kids love Jesus — Jesus himself is enough. When I don’t know if what I’m doing matters, or whether it will have eternal impact — Jesus is enough. When I or my loved ones deal with a difficult diagnosis — Jesus is enough. When someone I love is falling apart — Jesus is enough. Pray for provision for TODAY, laying all of tomorrow’s burdens on Christ and asking him to be all we need. Pray for an increased passion, urgency, and hunger to meet with Jesus daily. Pray for those who are starving without Him, and for courage to share the daily provision we have in Jesus with someone who will otherwise go without. There is a hungry world all around us, including so many children to whom we minister weekly. How do you need Jesus to be what you need for today? If you know you have Jesus, can you get through today? Is He enough? I’m praying that the hunger in our hearts would drive us to Jesus and that we would also break the Bread of Life with others. 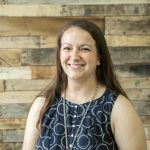 Whitney Julian is the Citylight Kids Director at the Midtown location in Omaha, Nebraska. Citylight Kids exists to help families Meet Jesus, Imitate Jesus, and Share Jesus through the Gospel, Relationships, and Service. She is married to Joe, a pastor, and together they have two girls and a boy. Prior to Citylight, Joe and Whitney spent six years living with youth at Boystown as a Family Teaching Couple. Whitney has a degree in Elementary Education, and has always enjoyed seeing the spark when a child learns something new – especially when they’re beginning to understand and enjoy the Gospel of Jesus! I enjoy reading this message especially in the morning to remind me of my agenda before i do anything else or i may forget that Jesus is with me, “Trust in the Lord with all your heart and lean not on your own understanding; In all your way sumit to him, and HE will make your path straight.” Proverb 3:5-6. Yes Jesus is enough for me today!!!!! Thank you.